My old bike tire is behind the new one. I finally figured out why my bike was getting flat tires so often. There was a hole in the tire itself instead of the tubes I put in them. I grew up in a town where bikes were used all the time to get places. I then went to college in a town that encourages bikes to the point that the town logo is a bike. There’s even a bike museum downtown. My point is, maybe everyone is not as aware of how bikes work as I am. Bike wheels have three basic parts, the wheel, the tire, and the tube. The wheel is the metal part with all the spokes on it that attaches to the bike frame at the center. If there’s something wrong with my bike wheel, I take it to my dad to fix it. Every other Saturday my dad repairs bikes for a charity, The Silicon Valley Bike Exchange. The tire is the rubber wall that incases the tube. The tire is the part of your bike that actually touches the ground. The tube sits between the tire and the wheel. It’s also made of much thinner rubber than the tire. The tube inflates and presses against the tire wall, giving it a firm shape that still yields to bumps and debris in the road. This allows a bike to ride over the various cracks in the road without giving the rider awful saddle sores. When you get a flat it is usually because of a hole in the tube. The tube is essentially a balloon, so it can pop if treated to roughly. Thorns are a good way to rupture a tube. I have a road bike, so hopping curbs will also cause problems for me. Over the past three weeks or so I have replaced my bike’s front tube four or five times. One of them popped while it was just sitting outside my house. Another as I was replacing it. Another popped on the first ride I took it on. I eventually decided to sit down, inflate a tire, and then watch it to see what caused it to pop spontaneously. As I waited I noticed the tube beginning to swell out of a hole in the side wall of the tire. A one centimeter bubble formed on the outside of the tire and then popped. So now I knew what the problem was! My old tire had rubber for the section that contacts the ground, but the sidewalls were made from interlaced thread instead. These threads had slowly come undone until a hole formed that was big enough for the tube to blow out through. Without the tire keeping pressure on the tube, it exploded like an overinflated balloon. You can see the frayed threads around the hole in the picture above. 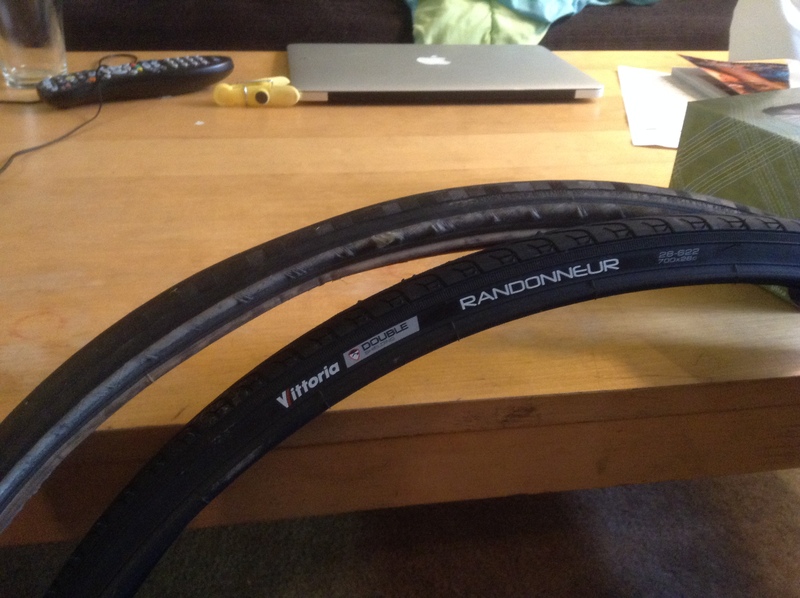 Finally realizing what the problem was, I got a new tire and replaced that along with the burst tube. My bike is all fine now and I’m taking it to work instead of the bus.